MooGoo Fresh Cream Deodorant – An aluminium-free, roll-on, natural deodorant. 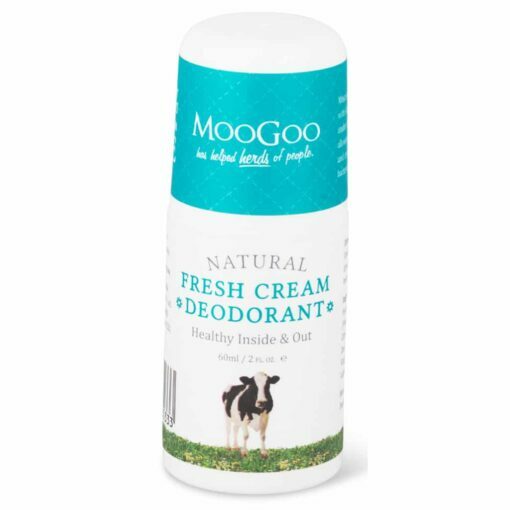 Free of aluminium due to our concerns about aluminium-based ingredients in antiperspirants. Slightly alkaline formula creates an environment that prevents odour causing bacteria. Allows you to perspire without crystals or overpowering essential oils that just mask odour. Lemon Myrtle Leaf Oil helps control bacteria from proliferating on the skin. Corn Starch helps the deodorant stick to the surface of the skin, so it can do its work. Ingredients: Aqua (H?Os Fancy Name), Magnesium Hydroxide (Milk of Magnesia), Xanthan Gum (Food Grade Thickener), Piroctone Olamine (Olamine Salt), Backhousia Citiodora (Lemon Myrtle) Leaf Oil, Humulus Lupulus (Hops) Extract, Zea Mays (Corn) Starch, Hamamelis Virginiana (Witch Hazel) Extract, Sodium Hypochlorite.